Back in January, on a rainy Detroit evening, seated in the second row of what will likely be remembered as the historic unveiling of the 2014 Corvette Stingray, I could do little but be overtaken with Corvette fever. Naturally, a lot of hype was built up prior to the new ‘Vette’s unveiling. After all, this would be the first Stingray model since 1967, and the premiere of the 2014 Stingray was sure to be nothing short of a spectacle. When the curtains finally raised I was surprisingly impressed. Always a bit wary of Corvettes, I wasn’t sure the new one would impress me much. For those of you who were not front and center, I thought it might be appropriate to take a closer look at the latest version of the most iconic American sports car, and offer up my initial impressions. Before I begin, I’d like to make it clear that I have not yet driven the Stingray; I have only ogled it from a few feet. Having poured over the fact sheet, I began to form some conclusions about this American wedge of aluminum, carbon fiber, and composite material. My opinions could all change when I get to personally experience the Gs (Chevy claims it’s capable of over 1g) the Stingray can achieve in the corners. For now, though, my opinions are mixed. Has Chevrolet really brought the Corvette into the 21st century or is this just another smoke and mirrors job? What’s in an old-school name? Chevrolet claims it wouldn’t have named this new Corvette the Stingray if it weren’t something special. While they’re right – it is a strong move forward for the breed – I’m not convinced the base model is quite deserving of the Stingray badge. Rather, I feel it might have been better suited to a higher-end model like the ZR1 replacement. Is it iconic? Sure. Is it cool? You bet. But is the base model worthy of one of the coolest car names ever? I’m not sure. You won’t see BMW throwing the M1 badge on the next 1 Series. Heck, you won’t even see BMW put the M1 on the new M1. Instead, they’re calling it the M8. 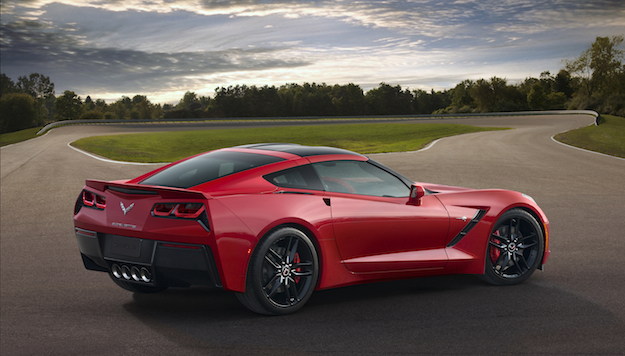 The Stingray is the best-looking Corvette in 40 years, hands down. 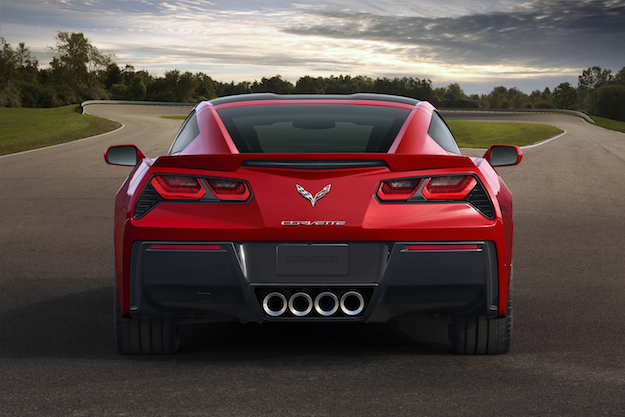 Chevrolet has smartly – and finally – done away with the dorky, round quad taillights and replaced them with much more reminiscent of the current Camaro, although this decision is hotly debated among the DT Car staff. The updated front end, again, reminds of the Camaro but this time of an earlier vintage, perhaps the third generation that began in 1982. The Stingray has been masterfully re-sculpted to move the car forward into the future while also incorporating its heritage. Chevrolet has formed the shapely new hood as well as the removable roof panel from carbon fiber. As usual, the fenders, doors, and rear quarter panels remain composite. Designers added carbon-nano composite underbody panels and a new aluminum frame, making the front-to-rear weight ratio 50/50. 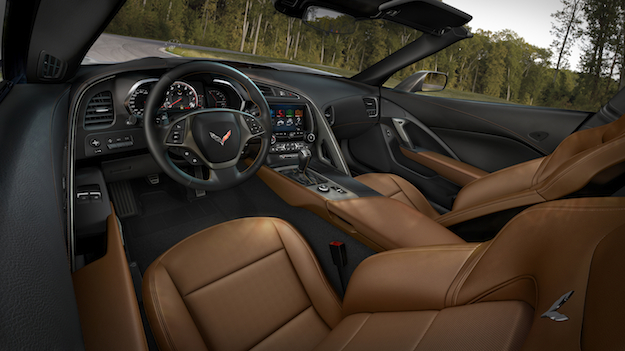 Thankfully, the interior has vastly improved from the previous C6 Corvette. Until the C7, the Corvette was a perfectly fantastic sports car with an interior that appeared to have been penned by a person missing two of the five senses: sight and touch. Now, however, it appears the new interior designer was blessed with all five senses. For 2014, Chevrolet conceived a rather novel concept: using real – not just simulated – high-quality materials inside the Stingray. These distinctive finishers include real carbon fiber, aluminum, and hand-wrapped leather materials. Additionally, Chevrolet designed an optional lightweight magnesium frame seat, saving weight and bolstering body support. I’m ironically applauding the Corvette interior here. Other – well, most – automakers have been using real materials for decades. Chevy finally stepping up its game is hardly deserving of a standing ovation. No one is dancing in the streets now that the Iranians have (allegedly) put a monkey into space because the United States did it over a half a century ago. Chevy is using real aluminum now and not some flimsy faux trim in a $60,000 sports car, and to be honest: It’s about damn time. While the Corvette has always been a bit antiquated – fast but antiquated – the new one is moving further up the technology totem pole. The Stingray features a “five-position Drive Mode Selector that tailors 12 vehicle attributes to the fit the driver’s environment.” Drivers will be able to select from one of five drive modes: Weather, Eco, Tour, Sport, and Track. While Eco, Sport, and Track are fairly cut-and-dry, Tour is what Chevy has set as the default daily driving setting. From there, the settings either ratchet up the performance – with Sport and Track – or ratchet down for Eco and Weather. In the center stack, Chevrolet has also installed an eight-inch infotainment screen that Chevrolet claims is “configurable.” Chevy hasn’t totally detailed what the configurations are, it has said, however, that the infotainment system will include 3D mapping. The 2014 Stingray features an all-new 6.2-liter V8 with direct injection, something Chevrolet calls “Active Fuel Management,” continuously variable valve timing, and a new combustion system that delivers more power while simultaneously saving on fuel. All told, the new V8 produces 450 horsepower and 450 pound-feet of torque. Bolted to the powerful new small-block is a seven-speed manual transmission with “Active Rev Matching” that anticipates gear selections and matches engine speed for “perfect shifts every time,” as Chevy puts it. 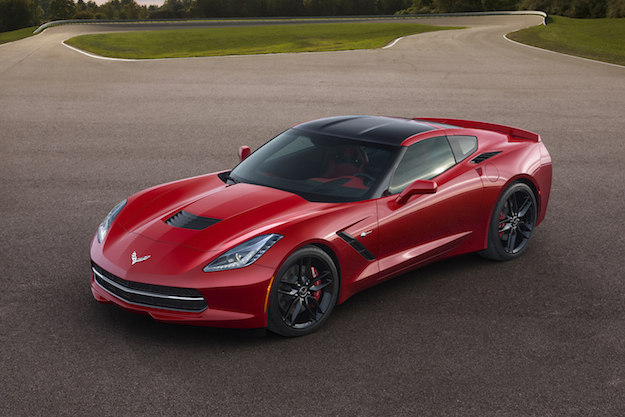 The 2014 Stingray will make a run from 0-60 in less than four seconds and Chevrolet also boasts the new Corvette will achieve 26 MPG on the highway. Not bad, not bad at all. When I was a child, my mother told me that only men with massive emotional deficiencies bought Corvettes. Forgiving her sweeping generalization, she was onto something. To me, there’s always been something a bit off about the Corvette. It was this mix of racing technology with stubbornness and refusal to modernize. Half the Corvette wanted to be a Porsche beater. The other half wanted to be a horse-drawn carriage with its leaf springs. You see, the Corvette is a perfectly good sports car, especially for the price. Although Chevrolet hasn’t made the pricing on the 2014 available yet, I suspect it’ll be right around the $50,000 mark. 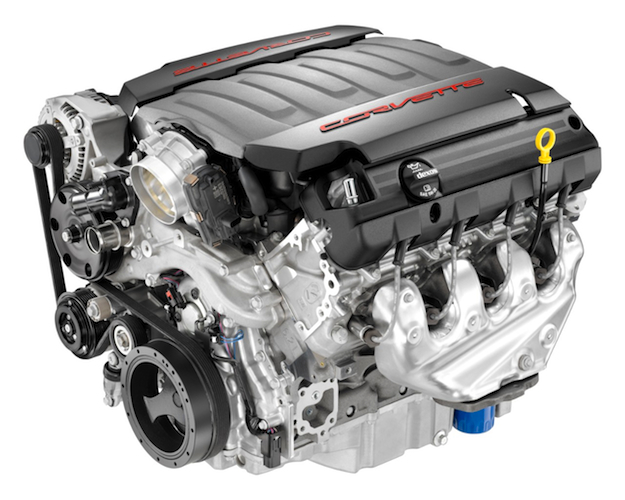 For $54,000, however, you can get the 2013 Camaro ZL1 which makes 580 horsepower and is capable of an 11-second quarter mile. Additionally, with the ZL1 you get all the standard track performance bits one would have to pay extra for in the Stingray with the Z51 Performance Package. I know I’ll probably get many angry comments telling me how the Corvette and Camaro aren’t comparable. But they are – and I just did. I like the new Stingray – a lot – more than I had expected. But after looking everything over, I’m not so sure I’m sold on it just yet.